« When will you suspect reno vascular hypertension ? 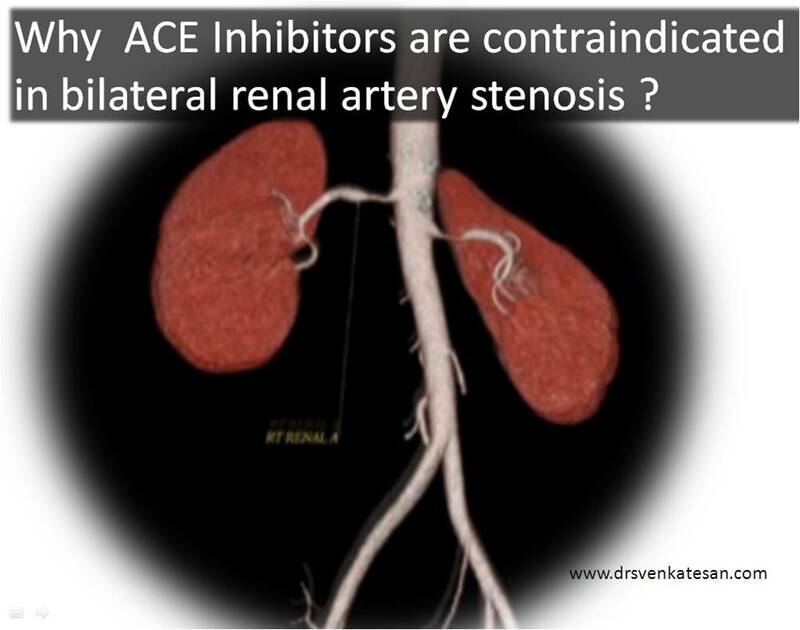 Why ACE inhibitors are contraindicated in bilateral renal artery stenosis ? It is traditionally believed , renal blood flow is critically determined by the luminal diameter of renal artery.But in reality there are more important factors other than renal arterial diameter that determine the glomerular blood flow. As in any vascular bed, it is the arterioles that determine the resistance and hence the flow . These arterioles form the critical resistance points and acts as check valves in this “vascular highway” flowing across the renal terrain ! Unlike other micro-circulations , the kidney has a special job to do , ie filtering the toxic molecules. Hence, for the blood entering the kidneys , even nourishing the kidney seems , a less important function ! The nephrons of the kidneys are probably the most “high – tech” cells in human body (Of course ,next only to brain cells ) .The vascular tuft of glomerulus located within the bowman’s capsule is perfused by afferent arteriole and drained by efferent arteriole . The entry of blood into glomerulus is regulated both by afferent and efferent arteriolar tone .These two micro-circulaoty units are under the sensitive control of both neural and humoral signals. Glomerular circulation is meticulously regulated by renal juxta glomerular apparatus.It modulates the glomerular blood flow by secreting renin which acts through Anigiotensin 2 on the efferent arteriole . The tone of the efferent arteriole is thought to be the single important factor in this servo control mechanism. What happens in bilateral renal arterial stenosis ? What happens when ACEI are introduced ? Once ACE inhibitor is administered , the efferent arteriolar tone is removed , this triggers the intra glomerular pressure to drop suddenly and filtration pressure reduces . Note: ACEI does not reduce the renal blood flow directly but the glomerular perfusion pressure drops hence precipitating acute renal function deterioration. What is your comment about the reno-protective effects of ACEI ? The medical science’s most crucial moments occur , when we confront two diagonally opposite views are debated and both suggest , there is definite benefit for the patient ! Cardiologists and nephrologists were always made to believe , ACEI are unfriendly to kidneys . But ,we now have evidence , ACEI is not an untouchable molecule in renal dysfunction. This is based on the observations made , over the years that excess Angiotensin 2 is ultimately a liability for the kidneys ! Looking at a long term perspective , AT 2 increases the intra -glomerular hypertension and ACEI inhibitors reduce it.This pr0tects the nephrons from hyper-filtration mode , that accelerates the glomerular injury . So , the current thinking is ACEI has a definite role in arresting the progress of renal cell injury . The only issue for ACEI is , it should not be continued if an ARF like picture sets in . (Acute deterioration ). Otherwise , in CRF at any basal level of serum creatinine , ACEI can be continued . Some think even an increase by few mg of creatinine can be allowed . How much elevation of creatinine is allowed in CKD with ACEI ? This is not answered yet . *Caution : The above conclusions on ACEI and creatinine was derived by me , based on with personal discussions with my Nephrology colleagues. It may be subjected to correction. When we start ACEI, almost 30% drop in GFR is expected…..
Hey There. I found your blog using msn. This is a really smartly written article. I will be sure to bookmark it and return to learn more of your useful info. Thanks for the post. I will certainly comeback. This was so helpful, such a clear explaination that no other pharmacist or cardiologist could give me, thanks so much! !